Mechanics are on stand by to assist with repair. Front forks, rear shocks, wheels, an endless list of components will fix up a bike in a jiffy. The Moab Cyclery offers showers and a changing area. So does Poison Spider Bikes. Poison Spider Bicycles prides themselves on building custom bikes suited to your size, weight, riding style and trail choices. Plenty of swag for sale in the retail department. And another skilled service department to help you with a fix. Rim Cyclery has racks of bike gear, components, gadgets and a helpful team to service the rental bike fleet and your own bike that may need a tune up or replacement parts. You’ll want to read the history, Rim Cyclery is Moab’s long withstanding bike shop of the community. Shuttles, Mechanics on duty, rental bikes and rental kid bikes, tagalongs, and trailers; the Uranium Bicycle building is a converted Gas/Service Station. Uranium’s slogan: “the future of all gas stations”. Happy to receive your shipped bike, assemble it and have it awaiting your arrival. All in all, you’ll find Moab Branded Swag at each of the Moab Bike Shops. Chile Pepper sells hydration packs, apparel, helmets, body armor, shoes, components and Bike Shop promotional items online. As well as manning the Moab shop for twisting wrenches, renting bikes, promoting the annual Chile Ho Down Bike event in October in Moab. See what’s up on Chile News. 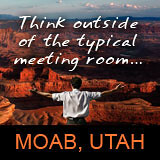 Coming to Moab to ride your bike? Plan to stop at all the Moab Bike Shops and get acquainted with some pretty good folks.